A PDF version of this article was published in the December 23, 2016 issue of Executive Intellligence Review and is re-published here with permission. Above: Hussein Askary. Right: his Arabic translation of the EIR Special Report, The New Silk Road Becomes the World Land-Bridge..
Ulf Sandmark (center) and Swedish architect Greger Ahlberg (left) with other members of the delegation of the Swedish association the Syrian Support Committee for Democracy, and the head of the Umayyad Mosque in Damascus (second from left), during their November 2014 visit to Syria. On December 17, 2016, the Syrian city of Aleppo was finally liberated from the barbaric forces of Obama’s Anglo-Saudi takfiri terrorists. After almost five years of their occupation of the eastern part of the city and the north of the province, this second largest city in Syria—a thriving economic and cultural center of the nation—has been reduced to little more than a heap of rubble. In the 2004 census, the population of the whole Province of Aleppo was 4.4 million, half of which, 2.1 million, lived in the city of Aleppo. The private sector dominated the city’s economy, reflecting the population’s high degree of entrepreneurship, with the majority working in small and medium industries and commerce. Sixty percent of the workforce was employed in productive enterprises, of which 25 percent was in manufacturing. Aleppo was the manufacturing powerhouse of Syria, as it was home to 30-40 percent of national manufacturing. The City’s export share was around 35 percent of Syria’s total non-oil exports. Moreover, Aleppo dominated both textiles and pharmaceutical industries in the country. The city had a substantial presence in all four subsectors of manufacturing: the textiles, chemical, engineering, and food-processing sectors. The Sheikh Najjar Industrial city outside of Aleppo, before and after the war. Much of Aleppo has been reduced to rubble over the course of the five years of fighting. The Sheikh Najjar industrial city is located 10 km north east of Aleppo’s city boundaries. Its construction was begun in the year 2000. This city, with its area of 4,412 hectares, included industry, housing, infrastructure, green areas, commercial services, and administrative areas. In 2009, 413 industrial firms were already operating there, and an additional 1,129 were under construction. 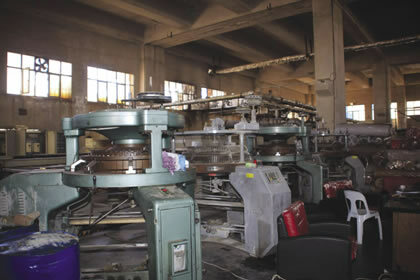 Its industrial area, which had been provided with world standard-infrastructure, was divided into three zones: light industry, medium-sized, and heavy industry. Fighting inside the industrial city between the rebels and government forces has now turned the Sheikh Najjar industrial city into little more than a ghost town. The Sheikh Najjar Industrial City was a very good example of the intentions of the Syrian government to pursue a process of industrialization. This process must be revived under the reconstruction process. 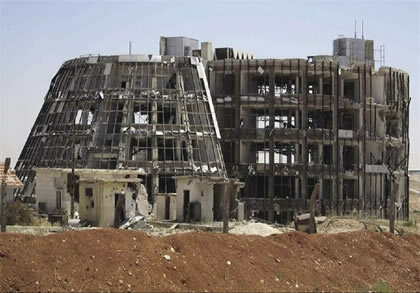 Damaged building in Sheikh Najjar Industrial City, near Aleppo, Syria. Aleppo is the oldest continuously inhabited city in the world. It has existed for more than 10,000 years. Since ancient times, Aleppo has been a hub of world trade between East and West, and its perfect position between the Mediterranean and Mesopotamia made it a major trade center. Throughout its long history, Aleppo has witnessed many moments of greatness and decline, survived massive turmoil and earthquakes both physical and social, and yet each time arose again like the Phoenix bird. The people and government of Syria have kept that same spirit alive today, in the face of the worst crisis in the country’s history. In November 2015, a delegation of the Schiller Institute and the Syrian-Swedish Committee for Democracy (including the co-author of this article, Ulf Sandmark) travelled to Damascus to bring humanitarian aid to the war-torn country, but more importantly, to present to the highest levels of the Syrian government, the Schiller Institute’s “Project Phoenix” for the reconstruction of Syria. The Arch entrance into western Sheikh Najjar Industrial City. 3. How Syria can benefit from connecting to the New Silk Road. Certain developments in the past two years speak to the Schiller Institute’s intervention and prove it to be timely and correct. The intervention of the BRICS nations in 2014 to change the decaying and destructive world order, was a major incentive for the Syrian people to follow this new paradigm. Thereafter, the direct military intervention by Russia in September 2015 in support of the Syria army and people in fighting the terrorists and forces of the dark ages, has set the stage for a completely new political and strategic geometry in that country and the whole region. On top of the Russian military intervention, on the economic side, Chinese President Xi Jinping brought the concept of the New Silk Road to southwest Asia and the Arab world in January 2016, during his visit to Egypt, Saudi Arabia, and Iran. Chinese and Russian government officials have visited Syria and offered to help in the reconstruction process. The Syrian Investment Agency (SIA) announced in April 2016 that it intended to organize a reconstruction conference together with the BRICS nations in the near future. In the mean time, in February 2016, Executive Intelligence Review produced an Arabic version of its special report The New Silk Road Becomes the World Land-Bridge, with an added feature on Project Phoenix. In this Arabic version, Helga Zepp-LaRouche, Chairwoman of the Schiller Institute, argued that connecting the Middle East to the New Silk Road project would be a key element for establishing peace and development in this region. Manufacturing plant in Sheikh Najjar Industrial City. A Hamiltonian national credit system can kick off the reconstruction process, despite the fact that most of a country’s previous physical economy and financial capacities are devastated. Examples like the newly founded United States in the late 18th Century, or Germany after World War II, can serve to demonstrate how a nation can mobilize to rebuild itself after a destructive war. The starting point for a credit system is a vision of reconstruction. This should include a centralized development plan, declaring step by step what the nation intends to accomplish at defined future dates. With this plan as the foundation, the government can issue the necessary credit to put the available workforce, tools, and materials to work. The projects can be run by either private entrepreneurs or government authorities. 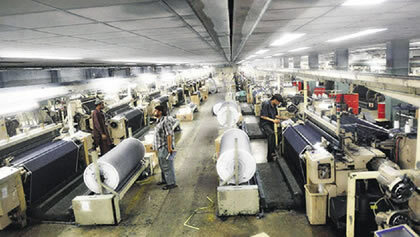 Textile plant in Sheikh Najjar Industrial City. For issuing this reconstruction credit, the government needs an institution devoted to rebuilding the nation, such as a National Bank or a special “Reconstruction Bank,” with majority Syrian state control over its stocks and policies. Special “Hamiltonian credit” should be provided by the state, either directly (through the Treasury) or through the central bank, to the Reconstruction Bank. It can also raise additional domestic capital for this bank in a way similar to Egypt’s mobilization of its people to finance the expanded Suez Canal: by stock offerings directly to the citizens of Syria at home or in the diaspora. With such a credit mechanism, the government can create enough credit for the rapid reconstruction of Syria. Furthermore, credits from private banks should be strictly controlled, to ensure that they are directed in accordance with the reconstruction plan, as categories of loans necessary for the physical needs of industries and the people. The expansion of credit is thus tied to the real economy. A domestic Hamiltonian credit system can enable national labor and resources to be fully employed and utilized, but it cannot pay for what needs to be imported. Usually, for that purpose, foreign currency, primarily from export income, is used. But that alone will not suffice for the massive reconstruction and development efforts needed. Syria will need huge loans in foreign currency, to be able to import needed machines and equipment. These loans may be linked to the reconstruction plan and the value of the projects being financed. They can also be part of export-credit agreements with industrialized nations to help import the needed machinery and technology into the country. In this way, the loans and their interest rates can be adapted to the long-term repayment possibilities derived from the projects they support. The BRICS New Development Bank and the Asian Infrastructure Investment Bank (AIIB) have been established to provide credit based on the potential of each project into the future, rather than being based only on the current payment capacity of the nation initiating the project. Thus, Syria has great potential to obtain financing in foreign currency for important large-scale infrastructure projects. Syria’s geographical position connects the continents of Asia, Europe and Africa in the World Land-Bridge. Reconstruction can be oriented to creating an infrastructure platform with the highest possible level of technology and productivity. A major upgrade of the chemical industry, based on oil and gas resources, can promote new industries producing fertilizers, plastics, pharmaceuticals, and other high-tech products. In line with the BRICS paradigm, the nuclear industry that was destroyed by Israel and by sanctions, can be resurrected both for power production and water desalination. The targeting and destruction of the Syrian pharmaceuticals industry by the enemy underscores its strategic importance, and the same goes for the embattled oil, gas, and petrochemical sectors. Also, the processing of cotton and other agricultural products in Syria’s renowned textile industry is a major reconstruction task, in addition to building other industries. Temporary work brigades mobilizing the unemployed could be financed in the same way, to build what is needed, while training the unemployed for higher-skill work. The Army Corps of Engineers could provide the kernel of these work brigades, and with such reconstruction projects continue its defense of the Syrian people. Syria’s national transport routes have to adapt to transcontinental routes from the Mediterranean Sea, the Indian Ocean, the Red Sea, the Caspian Sea, and the Black Sea. This was the vision of President Bashar Assad in his “Five Seas Strategy,” which he pronounced in 2009 before this war was waged on Syria. The New Silk Road strategy involves not only transportation alone, but international development corridors, which will bring long-term vitality and growth to the ancient crossroads of Syria. Besides railways, they include pipelines, water projects, industrial zones, agriculture, and city-building. The World Land-Bridge, conceived by Lyndon and Helga LaRouche, connecting the continents with development corridors centered on high-speed rail, and creating the basis for mutually beneficial development between all nations. Syria enjoys a perfect position between three continents, Asia, Europe, and Africa, and also between major bodies of water. Thus, it can connect to both the Eurasian-African Land-Bridge and Economic Belt of the New Silk Road, and to the Maritime Silk Road. 1. The West/East land route to Baghdad, Teheran and Asia. The New Silk Road Economic Belt extends from China to Central Asia and Iran, and further to Turkey and Europe. The Iranian transportation plans extend eastward to Iraq, Baghdad, and further along both Tigris and Euphrates rivers to Syria. The branch on the Euphrates River can also be connected to the Maritime Silk Road through the Persian Gulf and the port of Basra in southern Iraq, and northwest towards Deir Ezzour, Raqqa, and Aleppo. The old Silk Road along the Euphrates River from Basra on the Persian Gulf will reach into Syria, and from there, a railway connection to Europe through Turkey. Such a Euphrates railway, built in cooperation with Iraq, will be a big step toward regional integration and a development corridor extending from Persian Gulf, the Arabian Sea, and the Indian Ocean to the Eastern Mediterranean and Southern Europe. Another step to open up the old East-West Silk Road routes will be to build a 200-km railway from Deir Ezzor southwest to Palmyra, the legendary Silk Road city. This missing link will allow railway service from Tehran and Baghdad through these Syrian cities and onward, in the same direction, to Damascus and Beirut on the Mediterranean. 2. The north-south link to Egypt and Africa. A more direct land transport corridor can link Syria to the dynamically developing economy of Egypt through rebuilding the historical north-south transportation route in western Syria, also known as the Hijaz Railway from Turkey that runs south from Aleppo to Damascus, continuing to Amman, Jordan. Syria’s relationship with Egypt’s planned giant industrial zones along the New Suez Canal will be boosted by the railway link from Cairo to the Gulf of Aqaba, across the norther part of the Sinai Peninsula, and on to Amman. Moreover, Egypt and Saudi Arabia agreed in April 2016 to build a bridge across the Tiran Strait to the southern part of the Sinai Peninsula and northward across the Suez Canal Zone to Cairo. Syria and the Eastern Mediterranean and Asia will be connected to Africa through this transcontinental land-bridge across the Red Sea. 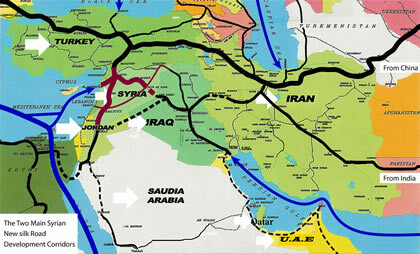 Lyndon LaRouche’s “Oasis Plan for the Middle East,” first publicized in EIR during the 1970s and revived in 1990 as the First Gulf War loomed, envisaged a north-south development corridor from Turkey to Egypt and Africa, running through Damascus, Syria’s Golan Heights, into Israel and the Palestinian territories in the West Bank and Gaza, then to Sinai in Egypt. This was the dorrect basis for a durable Israeli-Palestinian peace process, which is currently almost completely dead. 3. The northern link from Europe, the Black Sea region, and Russia. The Black Sea region will be connected to Syria through Istanbul and another Turkish port, Samsun on the southern Black Sea coast. Istanbul is also the destination for the new Viking Rail Line from the Lithuanian port of Klaipeda on the Baltic Sea, which will be a trade route from the Baltic Sea region and Sweden, southward to Syria. This is the way that Russia and the Caucasus will also come closer to Syria and Southwest Asia. 4. The Mediterranean maritime link. Since the inauguration of Egypt’s New Suez Canal in August 2015, enormous ships can now bring cargo flows from China and India on the Maritime Silk Road, to the Mediterranean Sea. Freight shipments and travel to Syria will then be possible via this canal and the Greek and Italian ports, if Syria’s own Mediterranean Sea ports of Tartus and Latakia are expanded. The population centers of Syria have historically evolved around the river systems and trade routes. Syria’s seventeen million population are concentrated in the western part of the country, in cities lined along the north-south trade corridors from Aleppo, Homs, Hama, and Damascus. Another concentration is on the Mediterranean coast and the richly rain-fed agricultural regions of Latakia, Idlib, and western Aleppo. The other population concentration is in the east of the country, in the Jazirah region between the Euphrates and Tigris rivers. These are rich irrigated agricultural regions that also enjoy a great concentration of oil and gas resources, and hydropower. From what is stated above, we can conclude that Syria enjoys all the necessary requisites for reconstruction: human and natural resources, strategic position, and a deep cultural heritage. In a peaceful and development-friendly international environment, Syria can quickly emerge out of the ashes of war. The Liberation of Aleppo should be regarded as a turning point, not only in the history of Syria, but of that region and the world, in the direction of leading the world towards peace and development. Richard Black: Who's Using Chemical Weapons in Syria?